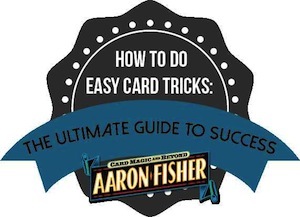 5 great Easy Card Trick Video Tutorials based on the tricks I share with my magic lesson students to make sure they get off to a successful start in card magic. These tricks are time tested. 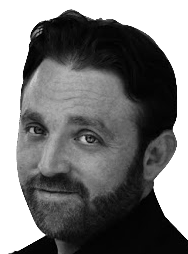 I’ve worked out and included every detail you’ll even need to make these tricks seem like miracles to any audience. Most important – these tricks are simple, powerful and easy to master. You’ll love them. 5 Powerful Video Tutorials to show you how to do some of the most important secret moves, often called sleights, in magic. I’ll show you how to make these special techniques undetectable – and how to master them without hours of practice and frustration. 9 Pro Performance Tips to arm you with ancient knowledge the best magicians have used for a centuries to astonish. Magic becomes a lot easier, and a lot more magical, when you know these simple ideas and use them to choose, prepare and perform your magic tricks. 8 Pro Practice Tips will make it easier than ever to get great results from even a little practice. These jewels will ensure you can master the simple secret moves that magicians need to make the best magic – and in record time. I’ve made this a two-part blog series. 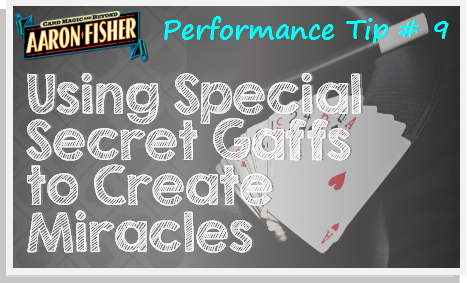 On this blog, you’ll find 5 Great Easy Card Trick Video Tutorials and 9 Pro Performance Tips. For part 2 of this blog series, I’ll be discussing the 5 Powerful Sleight Video Tutorials and 8 Pro Practice Tips. The table of contents below will allow you to find any tutorial or tip by category – so you can jump any time you want to any topic. In this first easy to do, incredibly powerful trick you’ll prove to even the most skeptical audience that luck doesn’t exist – and that with the right secret powers, a magician can control to most seemingly random actions. Grab a deck now and follow along with this complete video lesson. To download the No Such Thing as Luck Video Tutorial, right click here and save the video file to you computer! 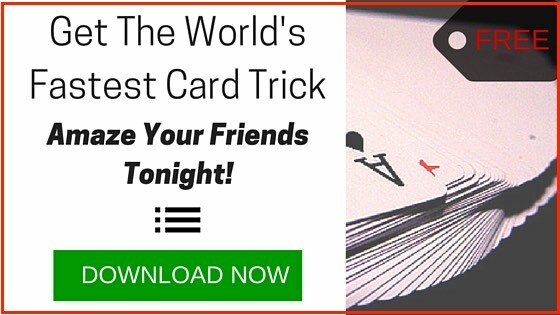 In this incredibly powerful trick done with ordinary cards, you’ll literally astound every audience you meet. First one red-backed card turns blue – then another. Finally the entire deck transforms. To see the surprise ending, you’ll have to watch for yourself! To download the Class Color Changing Deck video tutorial, right click here and save the video file to you computer! Traditionally, this great trick can only be accomplished by palming, which is the art of secretly stealing cards from the deck into one of your hands without anyone suspecting a thing. I built the version below for my students – so they could access this classic miracle without the practice required to palm cards. Pay special attention to this video. It will not only arm you with a great trick, but core concepts that govern all of the most amazing magic. To download the Flying Card to Pocket video tutorial, click here. The effect of this amazing card location far outweighs the few minutes practice time it will take you to master it. It’s so simple and easy, you can produce a selection using this classic production after just a few minutes of practice. This tutorial covers a great deal more than the move itself. To download the Three Card Catch video tutorial, click here. This remains one of my favorite tricks to this day. It shows how simple moves can be combined with just a little presentation to create and incredibly deceptive, amazing magic trick. In this video tutorial, you’ll also be introduced to one of the simplest, most effective card forces in magic. A card force is a move that allows you to have a card freely selected in effect. But in reality, the spectator takes the card you want them to. This simple move can be used to create literally hundreds of great tricks. Watch the video and practice the Force for a few minutes and you’ll have one of the most powerful card magic weapons at your disposal. To download the Prediction Miracle video tutorial, click here. 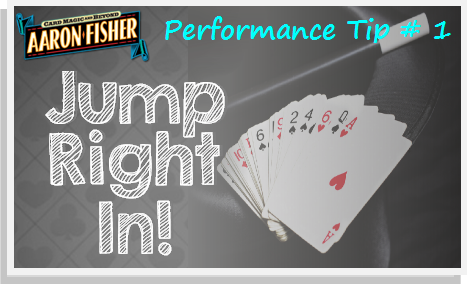 Performing your first card tricks can be a lot like jumping into a lake. You can either get in the water inch by inch – and experience the shock of cold water twenty times, or you can use the time tested approach and dive right in. You’ll feel the shock in one bright burst and then start playing happily in the water. Many of the students who take my magic lessons online are excited to perform magic, and at the same time, a bit terrified at the prospect. Difficult tricks that require advanced sleight-of-hand skills can take months of serious practice before you can even think about putting them into tricks. 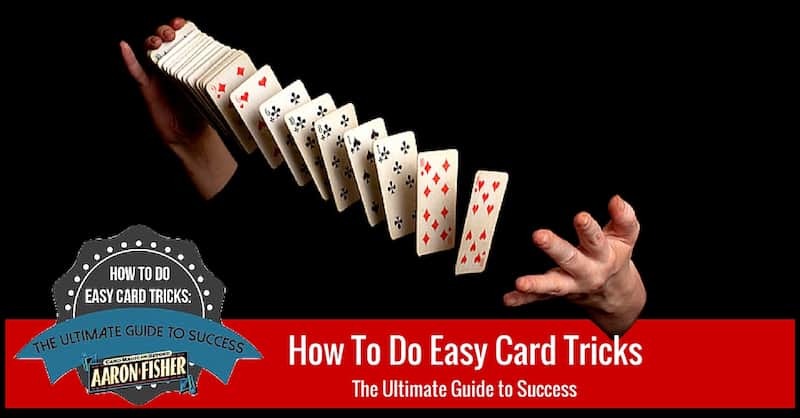 The idea behind starting with easy card tricks instead is that the easier a trick is to perform, the sooner you will have the confidence to jump in and start making magic. Always remember: no magic happens unless you show it to someone! For that reason, the best way to get comfortable in your new role as a magician is to find a simple trick, practice it ten or twenty times. Then start doing it for people. Don’t worry if you stumble several times or even make a mess of your first attempts to show people magic. It’s totally normal to mess up new tricks – no matter how long you’ve been doing magic. After a handful of performances, you’ll feel less nervous and more confident. Your tricks will start to go better. That’s the perfect time to re-read this guide. After a few performances, every direction in the Video Tutorials and every Pro Tip on this page will offer you new details you didn’t notice at first and the whole process will make more sense. In less time than you can imagine, you’ll have a real miracle you can use to blow anyone away. The key is to get started – everything else flows from there. At least 80% of the people who get interested in card magic feel that the easiest way to start is by showing your tricks to one person at a time. I know this seems like the best approach – and believe me, I tried it myself when i first started out. But along the way, i discovered a different path that works a lot better. It’s much easier to direct the audience’s attention when you perform for at least two spectators. Now you can, for example, say to the spectator on your left, “Do you think Anne over here has a strong sense of intuition?” The moment that happens, Anne is surprised. She looks at Sue. Sue is on the spot – she looks at Anne. It takes only a moment. But for that moment, anyone present will be drawn to watch the this ‘mini-drama’ play out. During this interval you have time all to yourself. You can do any secret move you’d like without anyone even raising an eyebrow. When at least two people watching – your misdirection skill and confidence automatically grows. Try this just a few times and you’ll see better reactions to your magic and more confidence in your tricks. And as I tell my students – don’t worry. After you develop the confidence that comes with doing strong magic for two or three people at a time, it will become much easier to get great results when you choose to do magic for just one person. When we seek out our first audiences, they tend to be members of our family or our close friends. Why? Because they’re willing to watch. And while that can be very comforting, in many cases, it’s easier to amaze perfect strangers than our nearest and dearest. Like any would be magic audience – our friends want to see if we can fool and amaze them, but because they know us so well – they often participate in ways no ordinary spectator would. They can be unnecessarily challenging to work for – and hard to get into the spirit of the game. That’s exactly what you don’t want during your first attempts at magic. You need casually interested, friendly people if you want to get a good ‘read’ on just exactly how well any trick really works. What makes a great easy card trick? Many of the easiest tricks, sadly, are not great. Some are downright boring. Have you ever seen the trick where the magician deals out three rows of seven cards? This is called the 21 card trick. It’s a classic mathematical ‘self-working’ card trick. It’s easy to learn, easy to do – but only a little fun to watch. If you’ve never seen the trick, watch the example in the link above and you’ll see a typical performance of this timeless puzzle. Is it puzzling? Yes perhaps. Is it magical? Absolutely not. , You may be curious or even fascinated by it, but you won’t be amazed. That’s because this simple card trick, and many like it, are not magic tricks at all. They’re easy card puzzles to be sure. But since they are not amazing, they’re not great tricks. 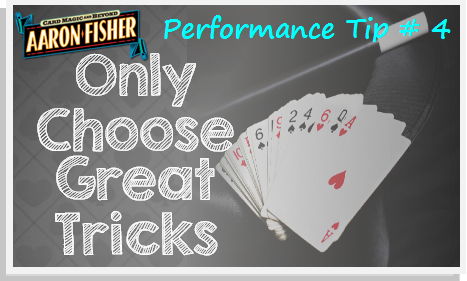 Even if you only want to perform the easiest card tricks, I suggest you stay away from tricks like this. They don’t amaze anyone and no one who sees one will ever beg you for more. Always make sure you choose a great trick because it’s awesome, not just because it’s easy. 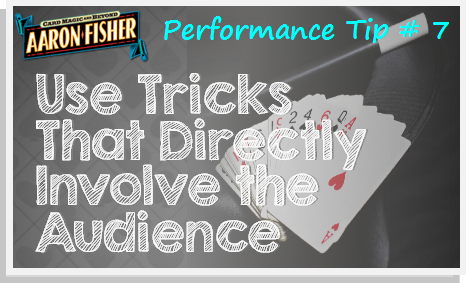 Every trick you perform will have a much better reaction if it’s shows a clear, magical effect. The tutorials on this page are designed to make sure you have tricks that are not only easy to practice and perform – but also, extremely magical for the audience. All the old magic books, and many of the new ones, instruct the new magician in the importance of having an interesting presentation to go along with the magic. And there’s no doubt, if you have an interesting world view or perspective suits your tricks, then presentation can truly enhance the overall experience of your audience. However, without care, this approach can backfire. 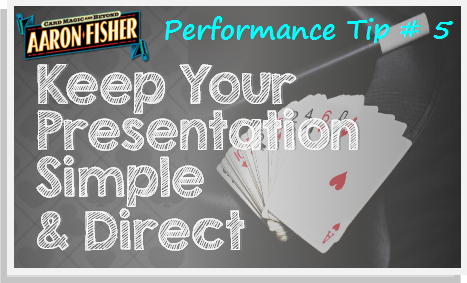 We’ve already discussed how important it is to know what you’re going to say during a trick. It frees your mind to strengthen the effect. The words you say are called the ‘presentation’ of the trick – and how you choose the words to say are very important to the end result. But now ask yourself, what first excited you about seeing magic? Was it the presentation of the magic you remember most? 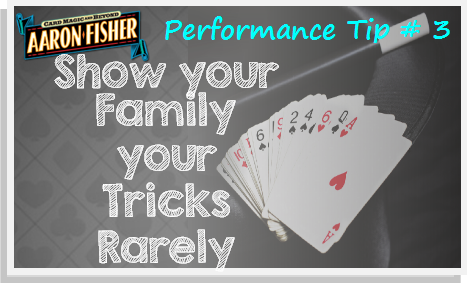 Perhaps – but it’s far more likely that a trick or performance left you totally amazed, with no clue to the method. And fascinated at the possibility of being able to create that same experience yourself. Your magic will be astonishing to the extent that your tricks are clear, direct and strong. It’s that simple. David Blaine made this obvious when he had gigantic success using minimal presentation. Blaine knew how to let strong effects speak for themselves, and one of his great gifts was knowing how to get out of the way of his own magic and let the effect of the trick communicate for him. Too much presentation can dilute the effect, so always keep in mind: your presentation must work in service of the trick – not the other way around. 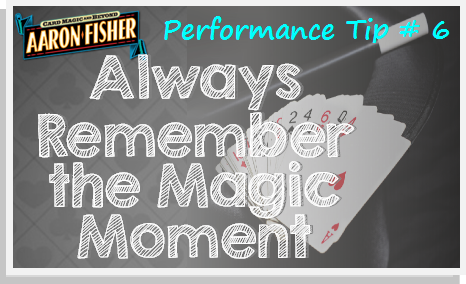 When you pass your hand over the pack, snap your fingers or wave the magic wand – that’s a magic moment. 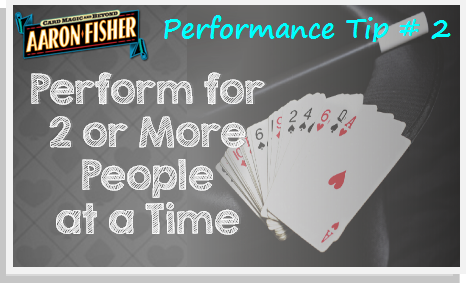 It’s seems so simple to us when we’re learning card tricks, yet most of us never use it, or even take it into account. Even so, from the audiences perspective, this is when the magic actually takes place! Magic moments are important. If you want to do great magic tricks, you must use these opportunities and commit to them. Watch the pros do magic and you’ll see, at the key moments when the magic happens, they use their imagination to envision that they really do have the power to make happen. When the audience sees the magic happen in your eyes, it makes the entire trick more believable – and much more magical. Also keep in mind – when you commit to a magic moment, it adds a layer of powerful misdirection and deception to your magic. Now, when the audience thinks about how you did it – they have to at consider, if only for a moment, that you may have actually done what you claim. It sews just a touch of doubt in the idea that you only do ‘simple tricks’. It forces the audience to use their imaginations. And that’s a good thing. After all, how can the audience experience magic unless you show them some? Try this idea out and you’ll see a difference in your reactions almost immediately. Whether you want to perform easy card tricks like the ones in this handbook, or you aspire to master expert level methods, there’s a simple truth you should keep in mind from the start: magic that directly involves your spectators will have far more impact than tricks where the audience just watches you do magic in your own hands. When we experience great magic – it’s because it happens to us directly. We don’t just watch. We feel the magic because we participate directly in the trick. Let that idea guide you as you choose what tricks to perform and you’ll be able to effectively choose tricks that will have real and lasting impact on your audiences. Here are two examples of master magicians who engage the audience at every moment. Enjoy! These are two of the greatest magicians of all time. Don Alan was one of the most successful, entertaining magicians of the last century. If you watch him, you’ll see no better example of a performer who knows the importance of audience participation. Watch him and you’ll see exactly what I mean. Juan Tamariz is the greatest magician alive today. As you watch this incredible card magic, pay close attention to how the master uses his hands, his eyes and his words to keep the entire audience riveted at every moment. Tamariz is truly the best! 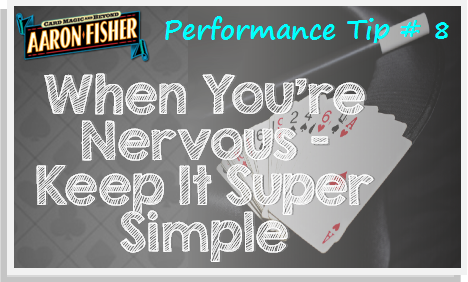 When you’re nervous – do the easiest tricks you possibly can. In fact, this is a good time to use an automatic trick. Just make sure there’s no way to get caught or exposed using secret apparatus, sometimes called gaffs. As the old advice goes – the moment someone catches you with a trick deck or special cards, you might as well retire for that audience – you’ll never be able to amaze them again. But bearing that warning in mind, many of the best tricks in magic rely on these devices. But more important – these tricks can help you build your confidence and amaze an audience at the same time. They can be a powerful bridge to get you from the starting block to tricks that require a sleight-of-hand. When I was in my early 20’s, I never would have taken such advice. I only wanted to do sleight of hand with ordinary cards – I simply wouldn’t use gaffs. Looking back, I know now I could have saved myself amazing levels of stress if I’d carried a safety net. A simple, powerful trick I could use at any time to either ease my shaky hands before trying out my new miracle, or to redeem myself after a magic train wreck. You’ll do yourself a great service by having a few great tricks of this sort in your toolbox. They’re simple enough to perform in short order and strong enough to close a professional show. They provide the perfect cushion to help you begin performing card tricks with confidence. You must use well designed tricks that make it easy to guarantee you’ll never get caught using anything other than ordinary cards. My original trick PANIC does just that! It’s helpful when choosing gaffed tricks to be sure the trick ‘ends clean’. In magic, this means that everything can be examined by the audience after the trick. Tricks that end clean are easier to perform confidently because you know that by the time the trick is done, there will be nothing to find. PANIC is one of my favorites tricks of this type. If you haven’t seen it, you should check it out now! If you enjoyed this article, check out the next part! just waiting for you inside! 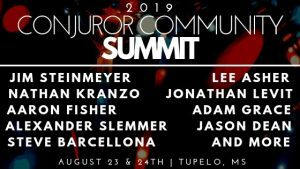 Aaron Fisher is widely considered one of the world’s top sleight-of-hand artists and his coaching programs have helped thousands of magicians. 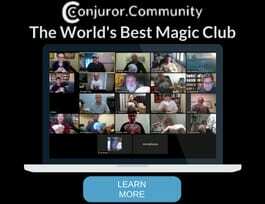 Magic Clubs: Is Joining One Right For You?